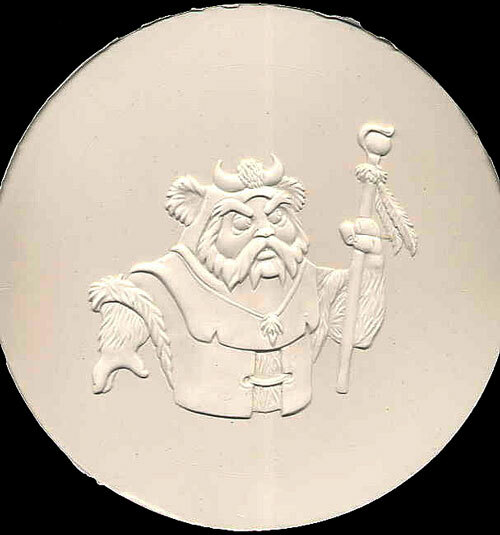 This is a softcopy of the unproduced Ewoks Chief Chirpa coin. It was made by pouring an RTV (room temperature vulcanizing) rubber compound--the kind that is normally used for making prototype molds--over the surface of a negative hardcopy, such as that seen here. While "softcopy" is not a term used by the people who made these prototypes, who typically refer to them simply as "rubbers," it has become standard terminology among collectors. It's a convenient term since it signifies the principle difference between these pieces and hardcopies. Whereas the coin hardcopies are hard and rigid, the softcopies are light and very flexible. In fact, the softcopies were made specifically to be flexible. Each was placed into a bowl-shaped template, so that its surface was distorted into a concave shape. Then a second hardcopy was made from it. Since this "stage 2" hardcopy was made by applying epoxy over the concave surface of the distorted softcopy, it ended up having a convex surface, meaning its center was slightly higher than its perimeter. It was this convex hardcopy that was used to cut the final production die, which was done using a pantograph device. Since a die used to produce coins requires a convex surface in order to stamp out the coins correctly, these "stage 2" hardcopies were necessary for use as tooling masters. And they could not have been made without the intermediate softcopy. Nearly all of the hardcopies and softcopies featured on the Archive are the results of two very significant prototype finds. The first, made in 1997 by Chris Fawcett, yielded the first softcopies known to the collecting community. Although collectors were for some time confused about their role in the coin production process, things were cleared up substantially in 1999, when a collector unearthed another stash of pre-tooling coin prototypes. Included in the find were over 100 pieces. Some were softcopies just like those turned up by Fawcett, but the bulk of the find consisted of negative coin hardcopies. Virtually all of these items--both hardcopies and softcopies--are one-of-a-kind pieces. Fortunately, along with these fabulous prototypes came considerable information regarding how the coins were made, including details that made the softcopies' purpose apparent for the first time. We have been very fortunate to have gathered so much information regarding the development and production of the POTF coins. To learn more about coin hardcopies and softcopies, as well as how the coin line in general was created, please check out the Special Feature article entitled A Coin is Born.